The Central Florida College Access Network, a public-private collaboration committed to raising the attainment rate of college degrees and high-quality credentials in the Central Florida region, has rebranded as UpliftED. The new name affirms the organization’s core belief in the power of education to elevate the Central Florida workforce, and expands the definition of education beyond the college setting. The brand’s new logo, color palette and graphic style will roll out across all communication platforms over the next few weeks, including their new website, UpliftED.org. Amidst the change, UpliftED mains focused on the priorities and goals that they adopted at their founding in 2013. The partnership has led the effort to address barriers to college and career access, persistence, and attainment in Central Florida. They are working toward the Lumina Foundation Goal 2025, which is committed to increasing the number of adults in the local community with a high quality credential or degree to 60% by 2025. UpliftED is a community-based college access alliance of community and education leaders representing K-12, higher education, the nonprofit sector, government, business, and philanthropy. Thank you to all who attended our Central Florida College Access Network relaunch celebration! We had a great turnout with attendees from our local education institutions, foundations, and corporate partners! Read below for a recap from the September 10th meeting. “Alone we can do so little, together we can do so much”, said Bob McFalls, President & CEO of Florida Philanthropic Network. The CFCAN relaunch showed just how much we can do if we work together with a shared regional goal. Leaders from across Central Florida gathered on September 10th to hear an update on CFCAN’s past year, and a look forward to what’s coming. Chair, Daisy C Franklin, MSW, who is the Community Investment Manager at the Central Florida Foundation, kicked the event off by telling CFCAN’s origin story. Read her welcome letter here. CFCAN was proud to thank its investors who contributed to the College Access and Success Initiative match grant. With help from the Central Florida Foundation, CFCAN raised $56,000. This was matched at $50,000 from Florida Philanthropic Network in partnership with Helios Education Foundation and The Kresge Foundation, coming to a total of $106,000. We extend great thanks to our investors: Wells Fargo, Florida Blue, SunTrust Foundation, Bank of America, University of Phoenix, and The Desai Family Foundation Fund at Central Florida Foundation. Leaders from each of CFCAN’s Areas of Impact presented their workgroups and recruited new members. Brian Lucas of University of Phoenix explained the importance of targeting Adult Learners to reach our attainment goals. Robin Oliver of Orange Technical College showed us how building off of each other’s strengths in the Career Connections workgroup can push our region towards achieving ready and willing talent supply. Bethany Bower explained the importance of focusing on Scholarships & Financial Aid to ensure students are taken care of when it comes to both access and persistence. Those in attendance committed themselves and/or the institutions they represent to the mission, vision and future of CFCAN. You have the same opportunity by reviewing and signing the CFCAN Membership MOU. To learn more, contact us to subscribe to our newsletter, tweet us @CentralFL_Can, or send us an email at goingtocollege@hfuw.org. Come celebrate our 5th anniversary of the Central Florida College Access Network at the relaunch meeting on September 10th from 3:00 pm - 5:00 pm at Heart of Florida United Way! RSVP below. Come celebrate and thank our investors (to be announced!) who contributed to the CASI challenge grant this year. CFCAN was challenged by the Florida Philanthropic Network in partnership with Helios Education Foundation and the Kresge Foundation to leverage a matched grant with the mission of enhancing, strengthening, and sustaining the Central Florida College Access Network. Thank our investors and find out more details on September 10th! Additionally, members will be encouraged to take action by joining a workgroup in one of our Areas of Impact: Adult Learners, Career Connections or Scholarships & Financial Aid. At the meeting each workgroup chair will present their area of impact and what CFCAN intends to accomplish this year. Attendees will be asked to sign a membership memorandum of understanding (MOU) where they will commit to take action and join a workgroup. Hear from our special guest speaker Mark Brewer, President/CEO of the Central Florida Foundation and Chair of the CFCAN Leadership Roundtable. Mark Brewer was selected as President and CEO, and joined the Central Florida Foundation board of directors in 2000. Mark has earned respect for his ability to build community partnerships that meet issues head-on and produce measurable results. He has worked with hundreds of individuals, families, and corporations to establish philanthropy plans, endowments, funding strategies, and planned gifts. More than 100 regional nonprofit boards have enlisted Mark’s assistance through the Foundation with strategic and scenario planning initiatives that included the use of endowed investments to sustain their organizations. He is a well-known national speaker on the independent sector, philanthropy’s role in America, venture philanthropy strategies, and the role of the independent sector in public policy. In his leadership role at the Central Florida Foundation, Mark frequently advises private and corporate foundation grant-makers across the region. The FAFSA form is the first step, and often the first barrier, for those looking to attain a postsecondary education. According to FCAN, in Florida only 49% of high school seniors during the 2017-2018 filled out their FAFSA form, 59% of which would qualify for Pell Grants. That means those high school seniors who didn't fill out a FAFSA form missed out on millions of dollars in Pell Grant aid alone. So what is stopping more than half of all Florida high school seniors from filling out FAFSA? This is what we see students saying across the nation - FAFSA is complicated, the form is long, and verification further complicates the process. This year Bill Gates advocated for simplifying the federal financial aid form. Two of his arguments included support for simplifying the FAFSA form process, and taking the application mobile. 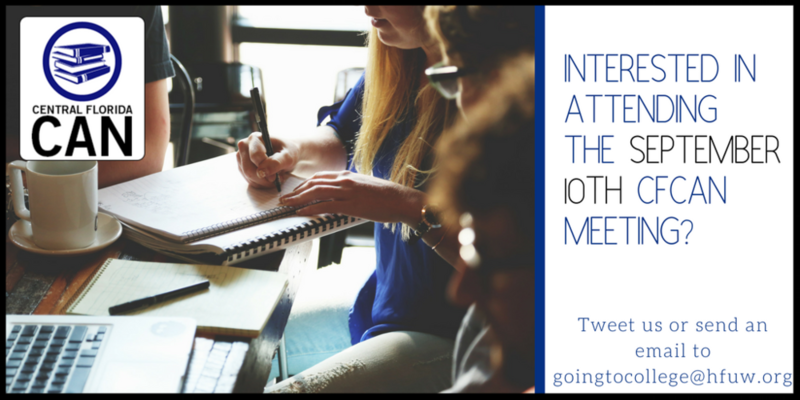 Today students have more access to phones with internet access than they do traditional computers. By going mobile, the FAFSA application can reach those students who could not or would not fill it out in previous years. This month the U.S. Department of Education announced they have released the beta version for a new mobile app called myStudentAid. As of now students and parents can fill out the form, submit their FAFSA application and view their student loan history. In the future the app will be updated to include the ability to correct a previously filed FAFSA form, renew an application or access tax information from the IRS. The U.S. Department of Education has also simplified the online form so that students are not answering redundant or non-applicable questions. 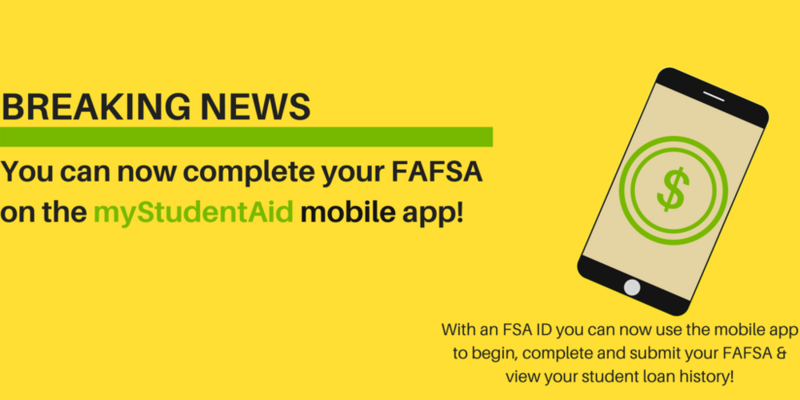 Are you planning on using the new mobile app to fill out a FAFSA form this year? What do you think of the changes the Department of Education is making to the process? Tweet us @CentralFL_Can!